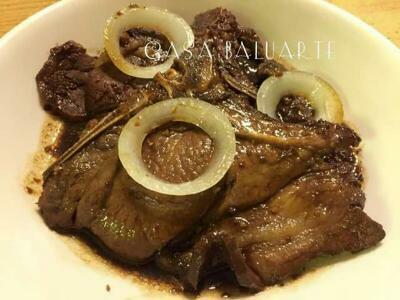 Bistek recipe using pork instead of the regular beef. Turned out pretty good and tasty. 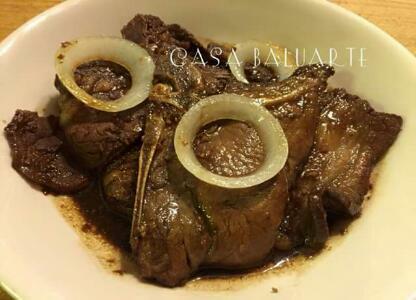 Using a deep bowl, combine soy sauce, vinegar, water, garlic, brown sugar and ground pepper. Mix well. Add pork, cover bowl and refrigerate overnight or at least for 3 hours. Remove pork from the marinade. Set remaining marinade aside. Fry pork in cooking oil till both side turns golden brown in medium heat. Pour in remaining marinade into the pan where you fried the pork. Simmer in low heat till sauce thickens. Add fried pork, simmer for few minutes. Remove pan from heat and serve hot.